The artistic project “Life and Strive” by the two young Berlin-based artists Anat Eisenberg and Mirko Winkel takes us on a journey into the world of the richest representatives of the global society. Our group consisting of 8 people (max allowed is15) was taken on an arranged meeting for buying apartments in the tallest building in Istanbul located in one of the most luxurious and fast growing parts of the city. Each member of the audience was advised to take on an identity of a potential buyer with an imagined, but still close to reality, biography. After the arrival we’ve been welcomed by a well-dressed salesman who didn’t spare time and energy to explain us in details all the specific characteristics of the building. And there was much to tell – from the state of the art eco-system that preserves 20 per cent of the energy to a golf course on the 38th floor and garden in the apartment. The price was such that probably none of us could ever be able to afford – from 1.7 to 7.8 million US dollars depending on the size, east-west exposure or which floor the apartment is on. This whole almost surreal experience lasted a little over an hour until one of the authors, still in the role of a “freelance agent”, called us to leave because our bus was waiting. Of course, no one made any deal about buying an apartment. This work raises so many questions on the line of what is “performative”, where is the performance and who is it aimed at that one may think that we are dealing with an ingenious work here. Unfortunately, that is not the case. It is only one of many attempts to transfer performance from specialized places into the public sphere and into everyday life. Nevertheless, the future participants of the “Life and Strive” project will have a memorable experience that will last for a long time. Anat Eisenberg and Mirko Winkel’s work Life and Strive is a closer examination of the production of desire in a two layered context; on the surface how the desire and need for million liras accommodations is created by intruding into the heart of a metropolis, and beneath how people from (possibly) other social classes react to it in a performative “opportunity”. The work consists of gathering of participants, informing them about the rise of “gated communities”, namely residential high-security towers throughout the city, and inviting them into these still under construction sites in the alias of high profile shoppers. This invitation comes as surprise if you had not read the program closely, and it is like a guerilla theatre for both the participants/performers and the towers’ client managers/performers, yet a more introversive one. I think I don’t need to criticize the high capitalist appropriation of public space nor the need for security and estrangement of high upper class in the middle of a city populated with 15 millions of people. I would rather problematize the performance. First of all, if we are supposed to feel resentment against this closed community, it must also be taken into consideration that the situation was actually “gated community versus performative community”; we did not interact with the sales staff sincerely either, we shielded ourselves with another appropriated “gate”. Furthermore, no matter with whom you are talking to, it actually humiliates you to fake an identity and giggle with irony inside without revealing yourself in the end, especially considering the fact that your critical approach towards these ugly buildings and the Faustian will to power behind them changes nothing in real life. However, upon reflection I felt that what Eisenberg and Winkel actually want to see is the degree of participants’ willingness and performative success/failure to accept the role of millionaire with briefly rehearsed arrogance and dis/interest; they create a milieu for strive to emerge. The only real audience in this performance is the two, walking beside two performative agents (salesmen and clients) like a ghost, muted, visually focused, taking pictures. Yet again, this also becomes problematic in the end; it harms your weakness and “innocence” up against these giant buildings at the cost of a semi-psychological experiment which has the danger of causing a self-accusation on the grounds of voyeurism and of latent desire to gather some sort of power (not necessarily political/to fight back). While we are trying to fit into our roles, to act up, to ask fake questions (though not purposeless), do we not actually get thinned into this world of illusions? Finally, that only a simple definition of us being “rich people” and not instead a loose script was given is a weakness on the performance’s part in technical terms. In addition, no option of withdrawal is offered during the beginning brief. I think that would enhance the quality of their overall research more. Intrusion answered with intrusion. A “nice” outcome is confronting with the fact that you have no control over Mephistopheles and no crack in this perfect system to become an activist, that you may condescend to a bitter performance of revenge with impotent strive. In the end, what you are left with is pure nihilism, fatigue and no desire to think further about this obscenity. The two young artists Anat Eisenberg & Mirko Winkel based in Berlin met each other in the MA-programme „Solo/Dance/Authorship“ at the Inter-University Center for Dance (Berlin). In their new work, created especially for the city of Istanbul, they do a research on the current trends in upper class residential buildings, which are based on the creation of self-contained, separate communities. A limited number of spectators/participants (maximal 15 people) is meeting on the rooftop of luxury Marmara Hotel, offering a stunning view over Istanbul. The artists introduce their work very briefly and inform us that we are going to have an appointment in such a building pretending we are willing to buy or invest. We are encouraged to create a fake identity in terms of believability. The duration of the transfer in a minibus stimulates various thoughts about identity, the further development and also doubts about the veritableness of the whole event. Will we ever arrive? We do! The two artists split the group and stay as “assistants” with them. Two different buildings are examined. A “real” sales conversation takes its course, finding ourselves in the 26th floor of the construction site of Rixos Residences with a breathtaking view, talking about prices and furniture. The absurdity of the whole situation, which started playful is getting unpleasant and objectionable. One of the interlocutors is not clearly aware of the fact that the entire dialog is not real, not honest. This unequal degree of knowledgeability makes the project non-transparent and somehow missing the point. The journey ends again at the starting point, but the “audience” is left alone with a lot of questions. What remains is simultaneously an abiding memory and unique experience as well as an indisposition and discomfort about the whole topic of differentiation, exclusion, affiliation and membership. Life and Strive is not a play nor a performance. It’s an orginal artistic proposition made by two young artists Anat Eisenberg and Mirko Winkel for a limited group of people (around 15 persons). The public meet the two artists on the top floor of a luxury hotel in the center of Istanbul. There, in front of the city view, the two artists explain their project : they show the biggest tower of the city to the audience, a residential project which construction is about to be completed. They invite the public to visit the apartements, pretending they are interested in buying one. And so it goes. Divided in two small groups, the members of the public are brought there in a van an soon go through a visit of apartments which they will never be able to afford (the prices range between 1.2 million dollars and seven million). Everything here is big and made for the richest : the view is breathtaking, the apartments are huge ; a golf, a swimming pool and a supermarket are under construction. What makes many people dream of discloses many terryfying aspects : the tower has everything of a golden cage. The view is breathtaking but no one can open a window ! What is interesting in this situation is that the members of the public are pretending. This self distance increases the feeling one has that everything that is seen and heard in this building project is fake (the building, the salesmen…). Unfortunately it is not. The role of the artists in Life and Strive is quite limited : they put the public in a situation they just chose. Difficult to call that a piece or a performance. But the content of it is interesting enough to be worth it. 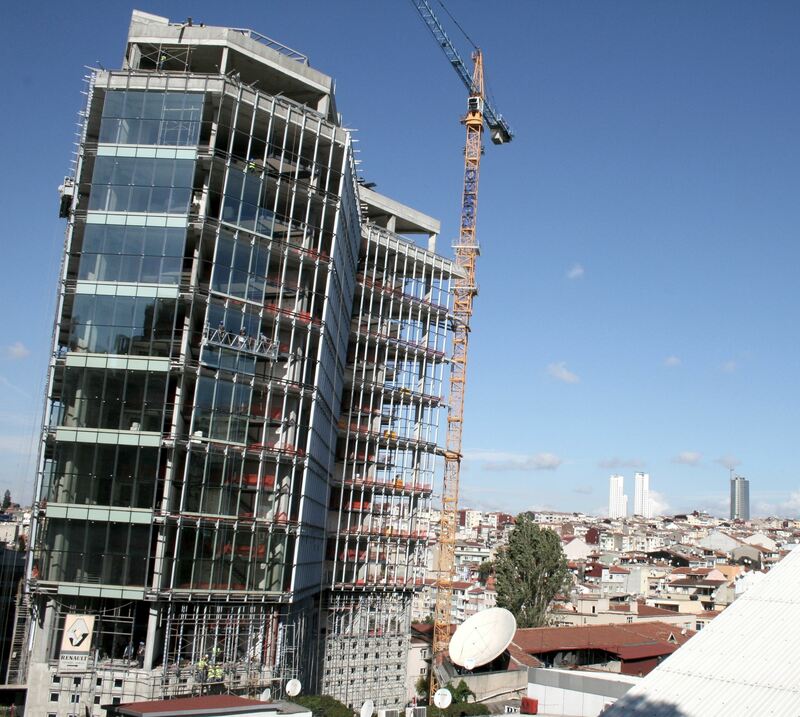 Istanbul Sapphire is a residential building in the heart of the city’s business area. A block of flats. It’s high – “the highest residential building in Turkey and in the whole Europe” (it has 54 floors), covered in glass, remarkably ugly and equally expensive. It’s a future gated community, where the owners will have exclusive access. Only potential buyers are allowed inside, to visit some of the common areas, the furnished model apartment on the 33rd floor and the terrace on the top of the building. So two artists – Anat Eisenberg and Mirko Winkel, both living and working mainly in Germany – decided that the audience to their newest project, Live and Strive, should assume the role of potential buyers in order to have access to Istanbul Sapphire – and a number of other upper class residential projects, as a matter of fact. The real-estate agent doesn’t know who these seven (eight?) people are. We know the situation is not genuine, we know we are performing roles. It could be the ideal condition for a performance of invisible theatre (a form of socially-engaged theatre developed by the late Augusto Boal, meant to emulate reality in order to raise consciousness towards social inequities) except for the fact that the participants are not professional actors, there is no script and no consciousness involved. (But yes, there was a moral/ ethical issue: why misleading the otherwise honest real-estate agent? Just to expose the secret life of rich people?) Even if the potential of the theme is quite generous: living in a building like Istanbul Sapphire resembles to waking up, every day, in a jar (a 1.2 to 7.3 million dollars per apartment jar), with the perspective of never leaving it, going in your slippers 30 floors downstairs in order to spend your evening in front of a TV with other several bored nouveaux riches and socializing with the guy bringing you the food ordered from the restaurant some other 30 floors below. The newest technology and a pointless existence – in his movies, Jacques Tati described it better than anyone else. If the text you’ve just read looks more like a society column in a more or less socialist-liberal newspaper, it’s because the Live and Strive experience of the author herself was least of all a performative one. But maybe ethical challenges are part of everybody’s personal dramaturgy of the self.